PB, Banana is the perfect combo! I could probably eat the whole loaf in one sitting. Going to make it tonight!! I usually go for making muffins because they are single serving, but this bread looks so moist (hate that word) that I want to try a loaf. I bet this is amazing with peanut spread on top of it too! I love the addition of peanut butter chips! Pure genius. Mmmmmm. Can’t you make low-fat banana bread by lowering the butter? Not to mention you added PB, too… Hmm. Have to give it a try. This looks great! I’m so excited to connect with you! Love your site! I never put cream cheese in my banana bread before. This recipe looks really good! Does this have more of a pound cake texture than typical banana bread? Nope! It is just like banana bread, maybe even more moist. This looks SO good! I agree with Mr. How Sweet about bananas-I can only eat them when they are slightly ripe. Once they get ripe, I freeze them to make banana bread whenever the craving strikes. My favorite recipe has sour cream in it (which makes it super moist). The cream cheese and heavy cream in this recipe probably have the same effect, and I love the addition of peanut butter! I can’t wait to try your recipe…thanks, Jessica! The original recipe from Chez Us has sour cream in it, I’ve made it before and it is delicious. I didn’t have any on hand which is why I added the heavy cream – just as good! girl, it’s all about the thick slices. and you had me at peanut butter. you should call this elvis bread, then butter it up, grill it, and put more PB and bananas on there! oh man, what a great combo – I love love love anything PB and banana. This would make a great treat for breakfast! I like the idea of adding cream cheese in there–I have never made it with that before. Peanut butter and banana makes such a great combo! Banana bread does not last long in my house either! This looks amazing! I actually have plans of making banana bread today myself! **and by your i mean you’re. I have to say, I share something in common with Mr How Sweet – I only eat green bananas. If there is ONE brown spot I will not eat it (I’ll turn it into soft serve or add it to my smoothie – will not eat plain). and you did NOT put cream cheese in here too??? Oh man, banana bread is one of my many vices. This may top even normal banana bread! your husband only likes green bananas? sometimes i wonder if our husbands are secret brothers. I love banana bread, but for some reason I have never added peanut butter or peanut butter chips. What is the matter with me??? This looks so delicious! And how can Mr. Sweet only eat green bananas? Those aren’t even edible! Adding cream cheese just sounds like pure genius. And a foolproof way to get me to eat an entire loaf of banana bread in one sitting. Oh a girl after our hearts. Peanut butter in banana bread!? GENIUS! I’m always looking for a new banana bread recipe to use up all those squishy nanners! If I made this, it wouldn’t last very long at my house either! But in all seriousness it is a good tip. If I cut my slices too thin I end up going back for multiple slices. I never think to you PB with banana but it seems so obvious now – they are so good together. 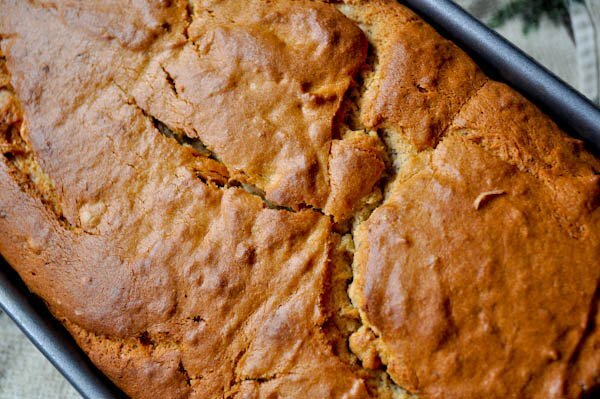 Banana bread is definitely one of the greatest bread recipes around. Peanut butter and peanut butter chips? I wouldn’t have lasted one hour with that thing. I’d be hovered in the corner with a fork and the entire pan whimpering in defeat. Green bananas? There is nothing I hate MORE. Mr. How Sweet if it wasn’t for our shared love for the Captain, I’d have to disown you. Jess, if it wasn’t for the poundcake my mother just so lovingly bought that I can’t keep my hands off, I’d be making that NOW. Perhaps tomorrow. Bananas and Peanut Butter are match made in heaven! I totally have some PB morsals I could put in this, Yummm. Dear God! This sounds absolutely incredible…I thought my love for banana bread knew no bounds..but this recipe looks like it’ll expand those boundaries. Thanks for the recipe, Jessica! Hi Jessica! I’ve seen your comments all around the ‘sphere and yesterday I finally clicked over and totally read almost all of your old posts and LOVED every minute of it. hehe So first… HI! I’m Mary. Nice to *meet* you!! :D Just wanted to introduce myself. I must say, I used to make my *famous* whole wheat chocolate chip naner bread, but how does whole wheat peanut butter chocolate chip banana bread sound? WOW! What a great idea you had! We have similar probs at my house. Things like banana bread NEVER last longer than 48 hours. VEIRD! lol Mr. What’s Cookin’ is a bottomless pit also ;) People have asked me if we eat the entire recipe of things I post on the blog (or if we have tons of leftovers – the answer is… nope!). The answer is YES, yes we do usually eat it all. If it says it serves 3-4, that means me and Mr. What’s Cookin’ had a great feast. PB and banana is a combination that can never go wrong! Mmm! Can’t wait to try! Peanut butter, heavy cream, cream cheese and pb chips? It’s like I died and went to foodie heaven. Regular banana bread doesn’t last long in my house, but add PB chips? Genius. Now I know what I am going to do with the bag sitting in my freezer. #1) Your photos are fabulous. 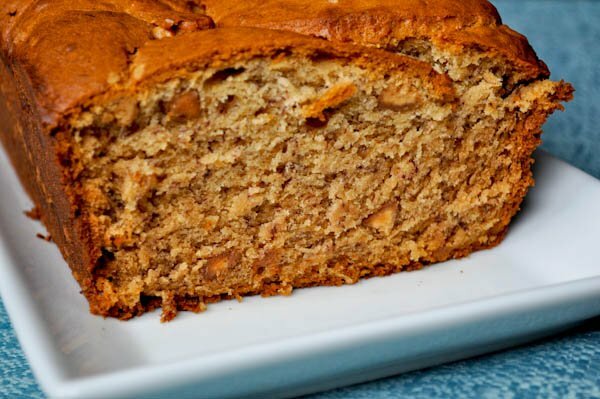 #2) This banana bread sound so unusually delightful. I love the peanut butter/cream cheese additions! this is just WRONG. bahhhh i want some!!! I absolutely DIE for banana bread and mixed with PB?!?! pure torture! 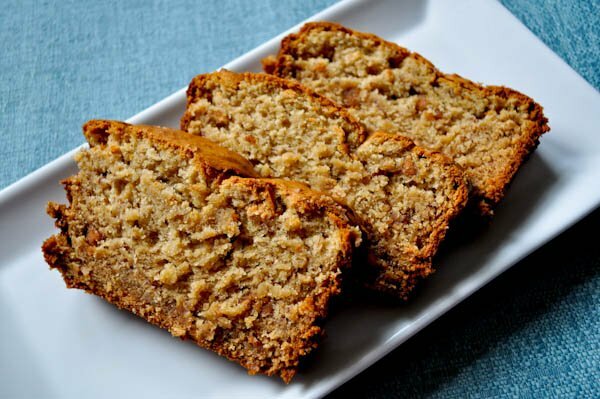 My MIL’s banana bread is my go to – it has a cup of oil AND two sticks of butter – what’s not to love? !